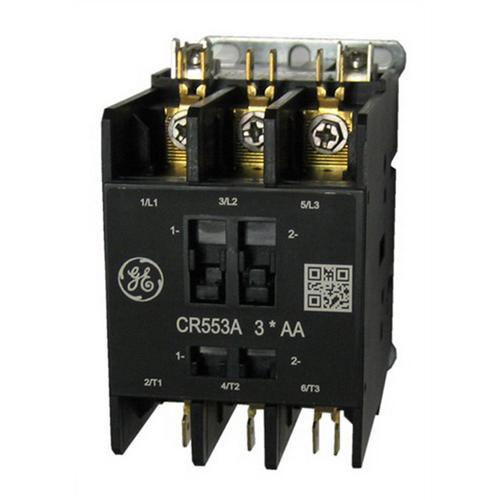 GE Industrial CR553 Series 3-Pole 1-/3-Phase Full voltage definite purpose contactor has coil voltage rating of 24-Volts at 60-Hz/50-Hz. Contactor has current rating of 25-Amps at inductive load and 35-Amps at resistive load. It has binding screw with quick-connect line and load terminal connection. Contactor has power rating of 7.5 hp at 240-Volts, 10 hp at 480-Volts, 10 hp at 600-Volts for 3-Phase and 2 hp at 120-Volts, 3 hp at 240-Volts for 1-Phase. It measures 3.5-Inch x 3.6-Inch. It is suitable for a variety of industrial electric equipment such as heating, ventilating, air conditioning, refrigeration, food processing and agricultural. It has significantly lower noise levels to ensure quieter operations. Cover enables visual On/Off status indication. Contactor is UL listed and CSA/CE certified.